When you think of market towns in the Cotswolds images of quiet tea shops and picturesque villages come to mind. But the peace has been shaken after car parking charges went up more than six-fold. The price hike has led to furious complaints from traders in Cirencester and Tetbury. Cotswold District Council raised charges from 30p an hour to £1 for 30 minutes in April. Long-term charges have more than doubled from £2.40 to £5 - leading to some traders saying they might have to close. Lizzi Pearson, who has run gift shop Willow in Cirencester for the past 12 years, says her trade dropped by 35% after the rise was introduced. Ms Pearson was so incensed by the rise that she initially refused to pay the increased charges. She only relented when one of her customers and an anonymous donor offered to pay the fines she incurred. "This is a quaint English town with little shops and businesses. People use their cars to come and go and the charges are making life difficult," she said. "It's very unfair because now people who work in the town centre are being asked to find an extra £15 a week to park." Ms Pearson, a mother of three, warned that she may have to lay off staff or even close the shop completely. "I'm going to give it until the end of August, but I really need to make sure I can support my kids." George Bristow, who runs Artique in Tetbury, says the town has been "brought to its knees". "Someone I know had to stop taking her child to nursery. She started parking on the street, but ended up having an accident. "There are even people here who can't get to the doctors because of the charges. "The council says it will monitor this over the next 12 months, but the community is on its knees now. There will be nothing left in 12 months." 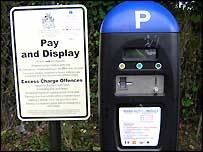 The parking charge meters in Tetbury have also been vandalised during the past few months. "It's because people don't know how to express themselves," Mr Bristow said. "It's indicative of how bad this problem has become." The situation in Cirencester has even prompted a shopping centre in nearby Swindon to employ some cheeky advertising tactics. The Outlet Village bought advertising space on the back of Cirencester car park tickets boasting that parking was cheaper in the Wiltshire town. 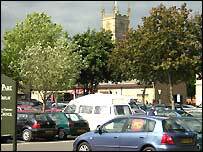 Cotswold District Council say that the criticisms levelled by traders are not fair, claiming a wider dip in retail is also to blame. "There was a feeling that car parking needed to pay for itself," Lynden Stowe, the portfolio holder for environment at Cotswold District Council said. "Compared to prices in other areas, such as neighbouring Stratford-on-Avon and Cheltenham, we felt our charges were too low. "In Cirencester we saw a 7% drop in ticket sales, but we anticipated more resistance - up to 20%. We don't think there's a considerable impact. "Tetbury went down by 20%, but 60% of the parking in the town is on-street and free. We think it shows there may be a wider reason. "There's so much adverse publicity about the charges maybe it's frightening off the public."